Home » Blog » Mains 2018: General Studies Paper: How IASbaba was Helpful in Answering More than 85 Percent of UPSC GS Mains Papers! 2018 year has been really kind for IASbaba and its followers. 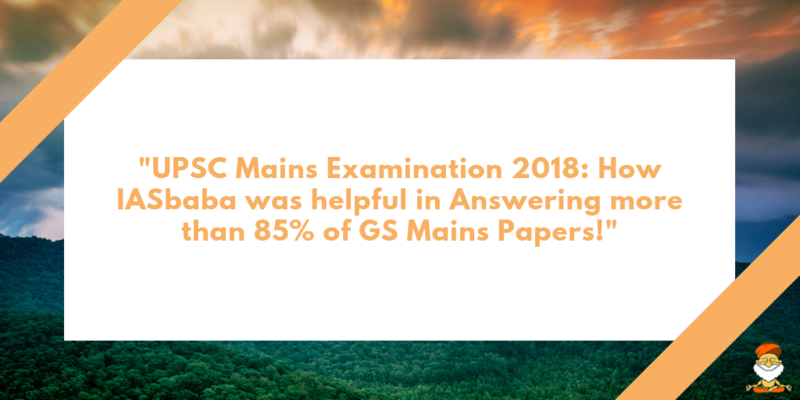 Firstly, when UPSC tumbled the whos who in Prelims – 2018, it was IASbaba and its ILP (Integrated Learning Program) that stood tall. The increasing popularity of ILP over the years bears testimony to ILP’s success. For us the Mains -2018 was very much on the above lines and we are extremely happy that we were able to equip our ILP, TLP and C2C followers to perform exceedingly well. We at IASbaba are expecting bigger and better results this year!! We write this post with great happiness to show how IASBaba helped its followers in answering the questions posed by IASbaba. A Note: Our programs are extremely focused and integrated.We have very minimal input. The high quality synopsis not only gives the solutions but also the approach to generate points for any question. You can see that from hardly 300 TLP questions we helped you hit close to 60% of the Mains questions with other programs such as C2C and ILP adding to the rest 85%. In GS-4, we never thought of being this close :). Haven’t included case studies but our students both online and offline have done really well because of the guidance on dealing with case studies. C2C Phase II, Test 8: Civil servants must have an objective and non-partisan approach towards work. Aren’t these qualities enough for smooth functioning of a bureaucracy? Why compassion and tolerance towards the weaker sections considered equally important? Analyse. C2C Phase I, Test 13: Public service must be more than doing a job efficiently and honestly. It must be a complete dedication to the people and to the nation. Comment. C2C Phase I, Test 13: Can transparency curb corruption? Critically analyse. In this light, examine the efficacy of the Right to Information (RTI) in bringing down corrupt in India. C2C Phase II, Test 8: What does the following statement mean to you in the present context: Sometimes, in order to follow our moral compass and/or our hearts, we have to make unpopular decisions or stand up for what we believe in. C2C Phase II, Test 4: Ethics are less a goal than a pathway, less a destination than a trip, less an inoculation than a process. Comment. C2C Phase II, Full Mock Test: What is more important to you- ‘purpose’ or ‘means’ of an action? Substantiate. C2C Phase II, Test 4: Are social influence and persuasion more potent tools to bring about behavioural change? Examine with the help of suitable examples. C2C Phase II, Test 12: Does taking recourse to laws, rules and regulations while facing ethical dilemmas in government ensure ethical decision making? Illustrate by taking suitable examples. C2C Phase II, Test 4: Can values be classified as ‘good’ or ‘bad’? Critically examine. C2C Phase II, Test 8: A person’s ability to perceive, identify and manage emotions allows him to develop the kinds of social and emotional competencies that are important for success in almost any job. Elucidate. Q.1) “Access to affordable, reliable, sustainable and modern energy is a sine qua non to achieve Sustainable Development Goal (SDGs).” Comment on the progress made in India in this regard. Q.2) Comment on the important changes introduced in respect of the Long-term Capital Gain Tax – (LTCG) and Dividend Distribution Tax (DDT) in the Union Budget for 2018-2019. Q.3) What do you mean by Minimum Support Price (MSP)? How will MSP rescue the farmers from the low-income traps? Q.4) Examine the role of supermarkets in supply chain management of fruits, vegetables and food items. How do they eliminate the number of intermediaries? Q.5) Discuss the work of ‘Bose-Einstein Statistics’ done by prof. Satyendra Nath Bose and show how it revolutionized the field of physics. Q.6) What are the impediments in disposing of the huge quantities of discarded solid wastes which are continuously being generated? How do we remove safely the toxic wastes that have been accumulating in our habitable environment? Q.7) What is wetland? Explain the Ramsar concept of ‘wise use’ in the context of wetland conservation. Cite two examples of Ramsar sites from India. Q.8) Sikkim is the first ‘Organic State ‘in India. What are the ecological and economical benefits of Organic State? Q.9) The China-Pakistan Economic Corridor (CPEC) is viewed as a cardinal subset of China’s larger “One Belt One Road” initiative .Give a brief description of CPEC and enumerate the reasons why India has distanced itself from the same. Q.10) Left Wing Extremism (LWE) is showing a downward trend, but still effects many parts of the country. Briefly explain the government of India’s approach to counter the challengers post by LWE. C2C 2018 Phase 2 Test 11: What are the challenges posed by left-wing extremism (LWE) in India? Also, examine the importance and limitations of infrastructure development in curbing LWE. Q.11) How are the principles followed by the NITI Aayog different from those followed by the erstwhile planning commission in India? Q.12) How would the recent phenomena of protectionism and currency manipulations in world trade effect macroeconomic stability of India? Q.13) Assess the role of National Horticulture Mission (NHM) in boosting the production, productivity and income of horticulture farms. How far has it succeeded in increasing the income of farmers? Q.14) How has the emphasis on certain crops brought about changes in cropping patterns in recent past? Elaborate the emphasis on millets production and consumption. Q.15) Why is there so much activity in the field of biotechnology in our country? How has this activity benefitted the field of biopharma? Q.16) With growing energy needs should India keep on extending its nuclear energy programme? Discuss the facts and fears associated with nuclear energy. C2C 2018 Phase 1 (Test 5) – Critically analyse the need for making India independent in nuclear energy capabilities. Also, throw light on the recent progress of nuclear development in India. Q.17) How does biodiversity vary in India? How is the Biological Diversity Act, 2002 helpful in conservation flora and fauna? Q.18) Describe various measures taken in India for Disaster Risk Reduction (DRR) before and after signing ‘Sendai Framework for DRR (2015-2030)’. How is this framework different from ‘Hyogo Framework for Action, 2005’? Q.19) Data security has assumed significant importance in the digitized world due to rising cybercrimes. The justice B.N Srikrishna Committee Report addresses issues related to data security. What, in your view, are the strengths and weaknesses of the Report relating the protection of personal data in cyberspace? C2C 2018– Data protection is one of the key elements for a robust cyber policy. Analyse. Q.20) India’s proximity to two of the world’s biggest illicit opium-growing states has enhanced her internal security concerns. Explain the linkages between drug trafficking and other illicit activities such as gunrunning, money laundering and human trafficking. What countermeasures should be taken to prevent the same? C2C Phase I Test 5: Restoring confidence in EVMs is not just a legal issue but also holds the key to restoring confidence in the idea of democracy as a whole. Comment. C2C Phase I Test 1: Parliamentary committees act as instruments for ensuring executive accountability. Elucidate. Also explain briefly the committee system of the Indian Parliament. C2C Full Mock Paper 2: Comment upon the changing role and significance of the Finance Commission in India’s rapidly transforming federal polity? C2C Phase II, Test 2: Localising governance is an offshoot of democratic decentralisation.Explain. How far local governance has succeeded in India? Critically evaluate. C2C Phase I, Test 1: The lack of funds, functions and functionaries plagues the institutions of local self governance in India. Illustrate. Also suggest remedial measures. C2C Phase I Test 6: Why does India have the maximum number of hungry and malnourished people in the world even after agricultural production being more than sufficient to meet the food requirements of the population? Examine. Also suggest measures to address this problem. C2C Phase I Test 13: Citizen Charters have largely been a failed experiment in India. Critically comment. Q.2) Assess the importance of the accounts of the Chinese and Arab travellers in the reconstruction of the history of India. Q.3) Throw light on the significance of the thoughts of Mahatma Gandhi in the present times. Q.4) Why is the Indian Regional Navigational Satellite System (IRNSS) needed? How does it help in navigation? Q.5) Why is India taking a keen interest in the Arctic region? Q.6) Define mantle plume and explain its role in plate tectonics. Mantle Plume is an upwelling of abnormally hot rock within the Earth’s mantle. It is core part of Plate techtonic principles and evolution of mountains. Q.7) What are the consequences of spreading of ‘Dead Zones’ on marine ecosystem? Dead zones are hypoxic (low-oxygen) areas in the world’s oceans and large lakes, caused by “excessive nutrient pollution from human activities coupled with other factors that deplete the oxygen required to support most marine life in bottom and near-bottom water. So, anyone clear with marine pollution will be able to write about it. Q.9) ‘Despite the implementation of various programmes for the eradication of poverty by the government in India, poverty is still existing’. Explain by giving reasons. Q.10) How the Indian concept of secularism different from the western model of secularism? Discuss. Q.11) The Bhakti movement received a remarkable re-orientation with the advent of Sri Chaitanya Mahaprabhu. Discuss. Q.12) Discuss whether the formation of new states in recent times is beneficial or not for the economy of India. Q.13) Why indentured labour was taken by the British from India to their colonies? Have they been able to preserve their cultural identity over there? Q.14) “The ideal solution of depleting groundwater resources in India is water harvesting system.” How can it be made effective in urban areas? Q.15) Defining blue revolution, explain the problems and strategies for pisciculture development in India. C2C Phase 2-Test 3: Despite being the second largest fish producer in the world, India hasn’t been able to extract the full potential of the aquaculture industry. Examine the reasons. How can the fishing industry usher in the blue revolution? Suggest. Q.16) What is the significance of Industrial Corridors in India? Identifying industrial corridors, explain their main characteristics. Q.17) Mention core strategies for the transformation of aspirational districts in India and explain the nature of convergence, collaboration and competition for its success. Q.18) ‘Women’s movement in India has not addresses the issues of women of lower social strata.’ Substantiate your view. Q.19) ‘Globalisation is generally said to promote cultural homogenisation but due to this cultural specificities appear to be strengthened in the Indian society.’ Elucidate. C2C Phase II, Test 5: How does globalisation lead to ‘biculturalism’? Is it happening in India? Explain with the help of suitable examples. Q.20) ‘Communalism arises either due to power struggle or relative deprivation.’ Argue by giving suitable illustrations.